The classic crossword game played by millions around the world. Use your seven letters to build crosswords, and use bonus spaces to add to your score! Genuine wooden letter tiles and racks. For 2-4 players. 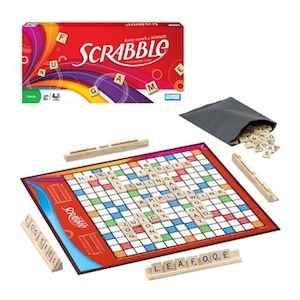 Includes Gameboard, 100 Wood Letter Tiles, 4 Wooden Tile Racks, Letter Bag. Winner of the Classic Award by Parent's Choice Awards. Ages 8 and up.